This is a collection-site for resources connected to my Antideutsche-project. Unfortunately almost everything is in swedish except the paper, "Deutschland von der Karte streichen, Polen muss bis Frankreich reichen!" 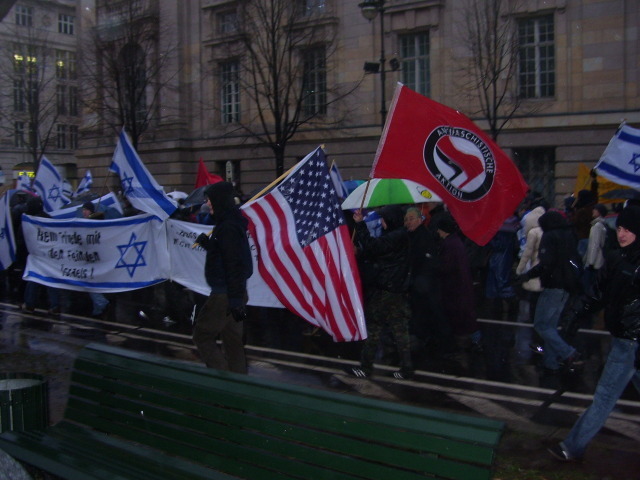 - An insight into the Antideutsche Antifa, Germanys pro-Israeli left-wing movement" below. The paper was presented at a conference at Uppsala university called: "Sverige och det tyskspråkiga Europa - samhälleliga och vetenskapliga frågeställningar" (Sweden and the german speaking Europe - societal and scientific approaches). You can find the conference program here. I got an interest in what I call the post-antifa movement, and also in other extreme left-wing and right-wing groups. If you share that interest or want to give me a tip (lead me) towards something to write about, please contact me (rikard[at]fribergvonsydow.se) so we can discuss.